This post is sponsored by Walmart and ShopStyle. I love parenting with brands that I love and trust. Post ideas and opinions are my own. Happy Friday, friends! Coming at you from Phoenix! I was so thrilled to spend the day by the pool yesterday and I’m excited for day one of the conference that I am here for! As I mentioned in last Friday’s post, I am partnering with Walmart for the next couple months to share my favorites with you for their We Dress America campaign! I have legit had the best time picking out pieces that I know we will all love! The quality and prices are amazing and I am living in my Walmart picks! Seriously, the workout gear from last week’s post and a few of the items from today’s post, have been on repeat! 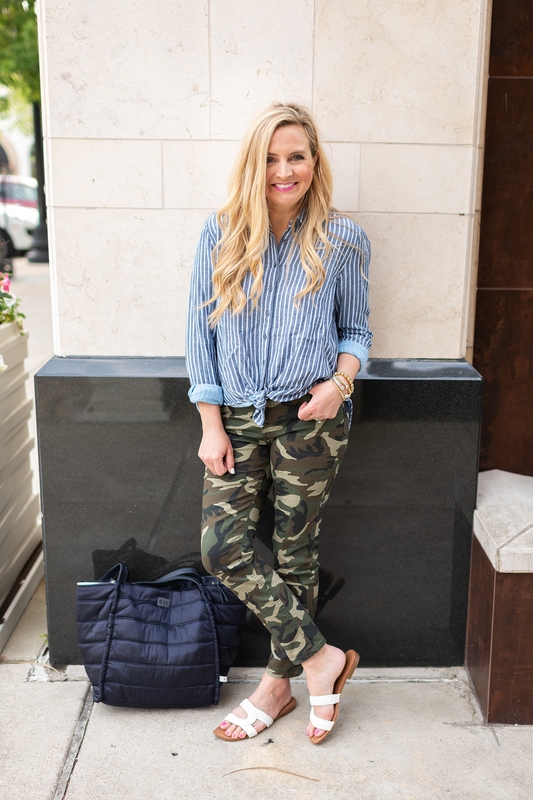 Today’s post is surrounding the camo trend. 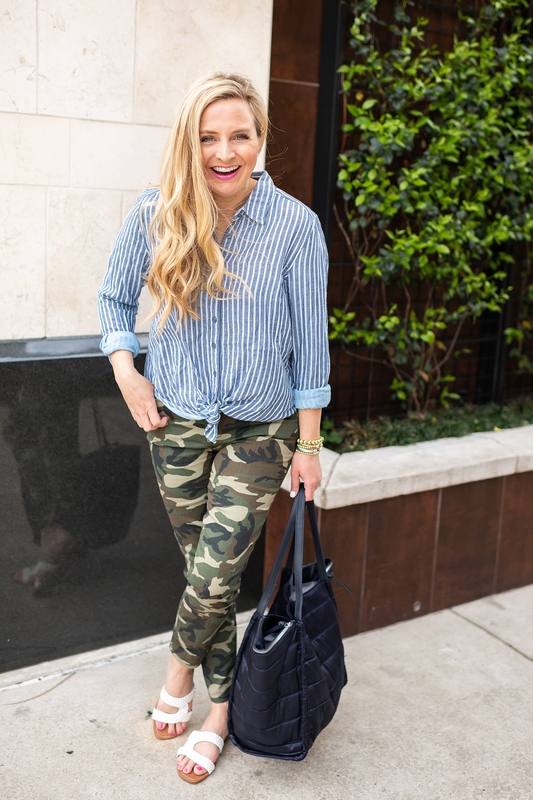 As you know, I am a huge camo lover and can’t get enough of it, just like leopard, I truly use camo print as a neutral. 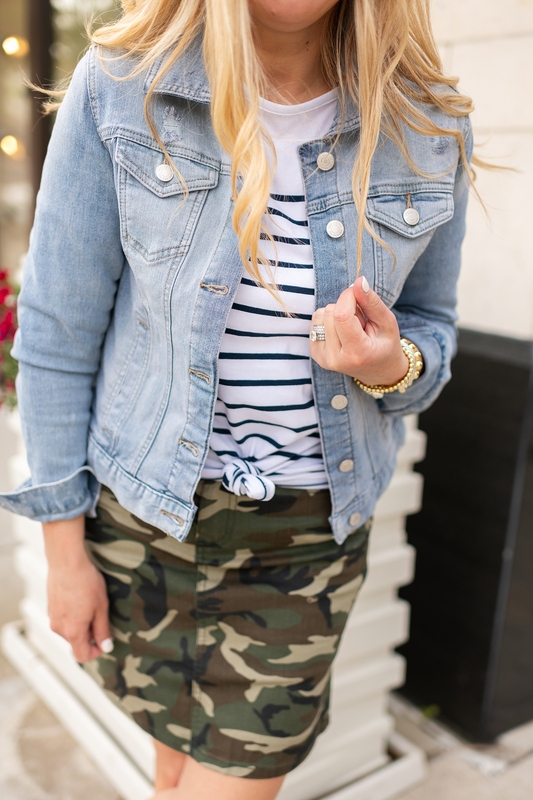 One of my favorite prints to pair with camo is stripes! I think they are so fun to wear together and with both stripes and camo, the possibilities are endless. Both outfits from today are super versatile, in the way that they can be worn together as I have them shown, or by themselves and with both looks, you can definitely mix and match the bottoms and tops! 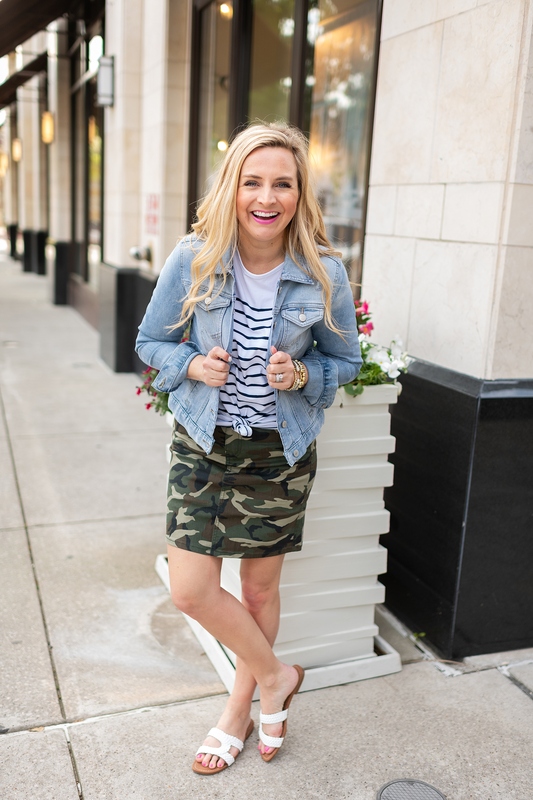 I’m super excited to share two ways to take camo into spring with you today! 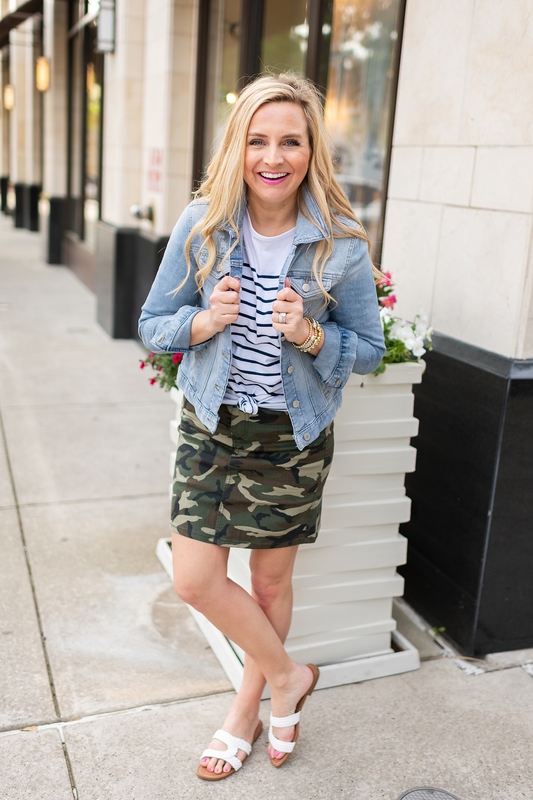 Camo Skirt, Striped Boatneck Tee and Denim Jacket- I think what I loved most about this look is just how cute it is for everyday! Let’s face it, most of us are spending our days running errands and getting all the things accomplished. 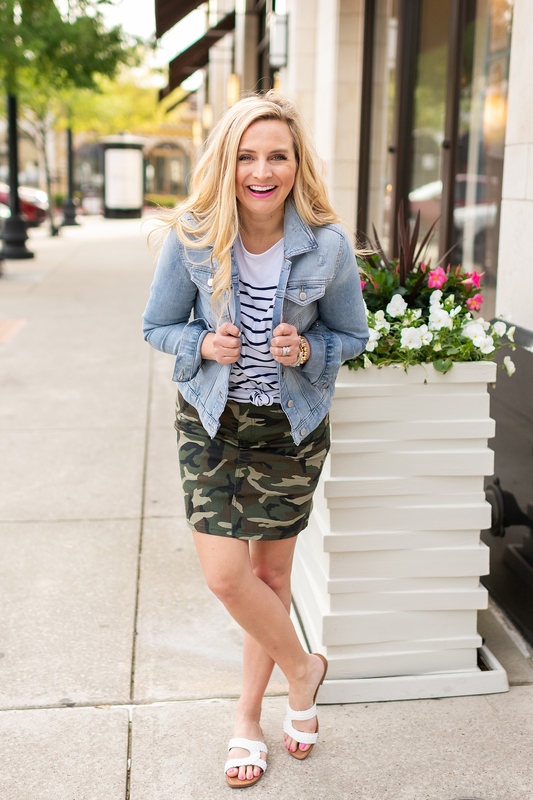 I really loved the pairing of this cute skirt, this fun tee and this fabulous denim jacket. As I mentioned last week, this jacket is a total must! It is an amazing price point and the quality is great and it has the perfect amount of stretch! I’ve been living in this jacket! 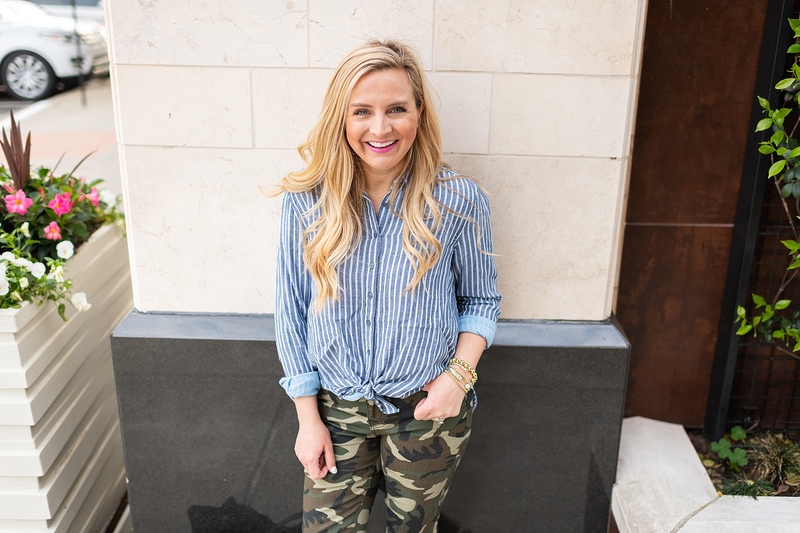 Striped Button Down Top and Camo Pants- These camo pants are so darn adorable and cute! I am loving them! They are cute as an ankle pant or you can roll them for a different look. Again, the quality is awesome! 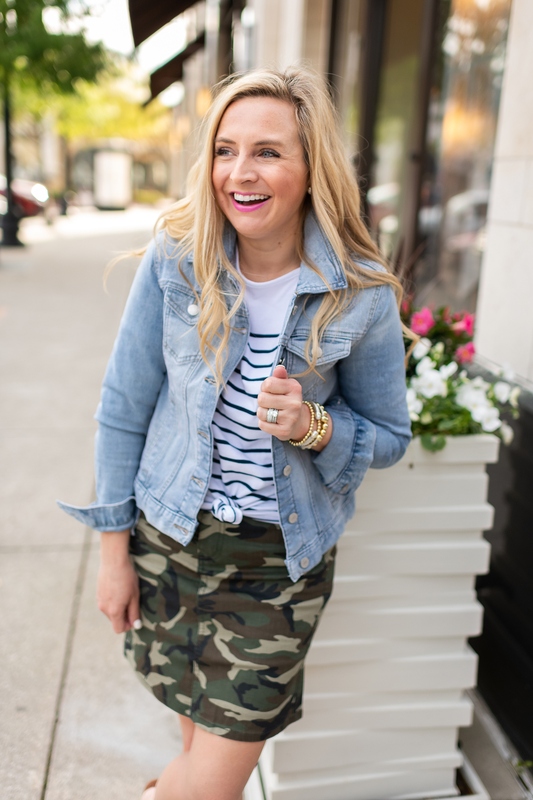 This striped top is one of my favorites from today’s post! 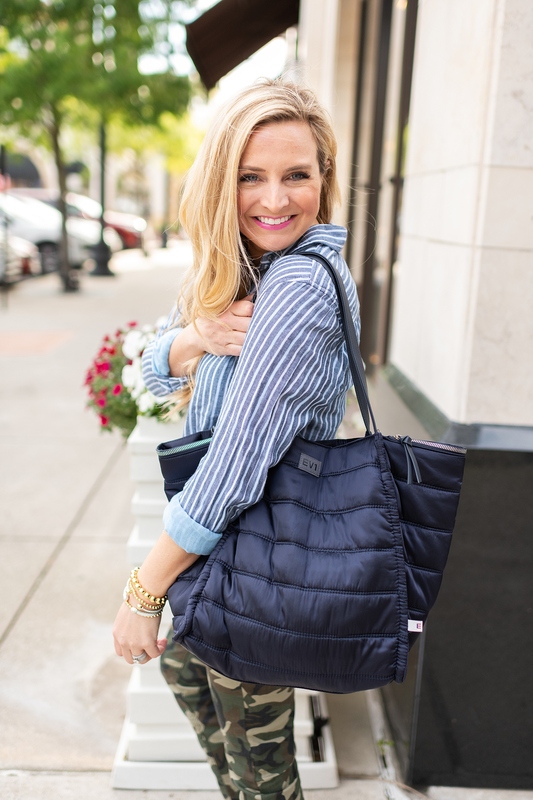 It comes in numerous color ways, but I couldn’t get over the cuteness of the blue and white striped! It’s a lightweight material and perfect to take you from spring into summer! As I mentioned in last week’s post, these tote bags are total musts! I am obsessed and so many of you told me that you ordered one (or more!) last week! 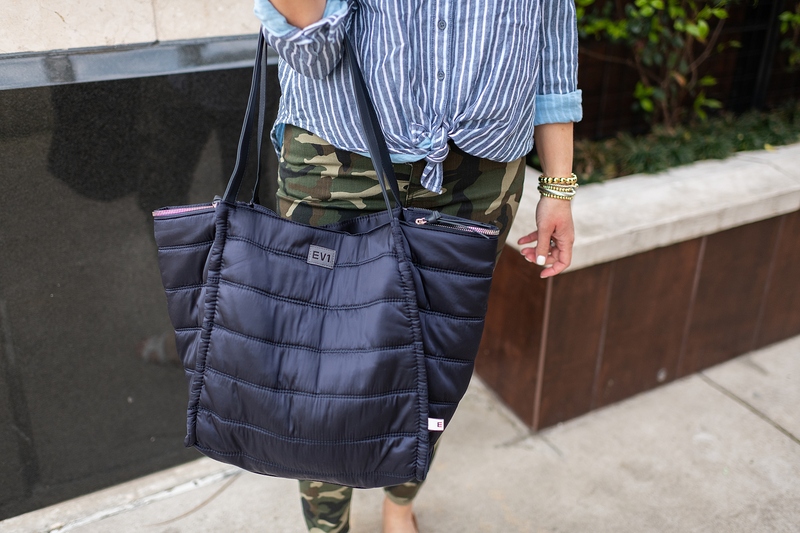 Be sure to grab this under $20 bag! You’ll love it!! Which look is your favorite? Is camo a neutral in your closet, too? I hope you have a wonderful weekend! XO!